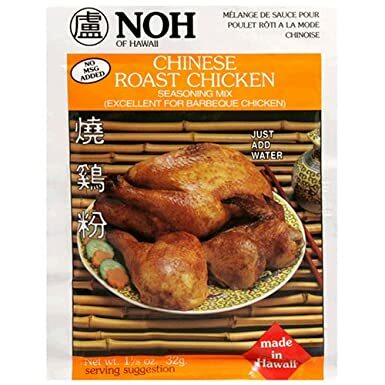 Want to make a perfect roasted chicken with the flavors that we all grew up with in Hawaii - try this easy chinese roasted chicken recipe! Rub softened butter on the outside of the chicken and under the skin. Sprinkle NOH Chinese roast chicken seasoning packets on the outside, under skin and inside of the chicken cavity. On a rack, place chicken sideways and cook for 20 minutes, turn chicken and face opposite side up and cook for another 20 minutes, then place chicken breast side up and cook for remaining 20 minutes. Chicken should be cooked. You can check by piercing near the thigh and juices should run clear. **note: if you are using a larger bird, increase cooking time by 20 minutes per pound.